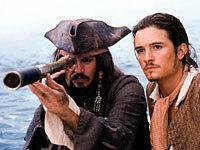 Overview - Blacksmith Will Turner teams up with eccentric pirate "Captain" Jack Sparrow to save his love, the governor's daughter, from Jack's former pirate allies, who are now undead. The original pressing of this disc included several mis-framed shots. Disney has since corrected this error, and is offering a disc replacement program for affected consumers. More details. It may be hard to fathom in retrospect, but 'Pirates of the Caribbean' was never supposed to happen. When it was first announced that Disney was turning its beloved theme park attraction into a motion picture, it was met with plenty of skepticism. How do you turn a cheesy, '50s-era boat ride into a blockbuster movie franchise? What's more, aside from Johnny Depp (who was not yet the Oscar-nominated box office draw he is today), there were no other A-list stars in the cast, only relatively unknown British actors with funny names like Keira Knightley and Orlando Bloom. Indeed, 'Pirates of the Caribbean' seemed like a recipe for disaster. Now here we are, only a few days away from the premiere of the film's second sequel (and purported trilogy-capper) 'At World's End,' and 'Pirates of the Caribbean' has earned its place as one of the biggest phenomenons in recent cinema history. 'The Curse of the Black Pearl' ended up reaping over $500 million in worldwide booty (the follow-up 'Dead Man's Chest' made even more), and Bloom, Knightley and especially Depp are now household names. Even more miraculous, 'The Curse of the Black Pearl' is one of the few recent high-concept Hollywood insta-blockbusters that saw both critical and commercial love in equal measure -- the reviews were almost as good as the grosses. Given such success, it was with some trepidation that I sat down to revisit 'The Curse of the Black Pearl.' Everyone is familiar with that feeling of disappointment when your favorite old blockbuster just doesn't hold up on repeat viewing. Yet it only took a few minutes for any fears I had to evaporate. 'The Curse of the Black Pearl' remains a rousing, grand adventure, but -- even more important -- it's a reminder that Hollywood entertainment flicks can still take genuine risks. In hindsight, it seems like all the pre-production naysaying may be what really charged up the juices of the filmmakers to take a silly idea (a theme park ride movie!) and deliver more than anyone expected. Anchored by an edgy, fearless performance by Depp as the now-iconic Captain Jack Sparrow, 'The Curse of the Black Pearl' bravely, but humorously, takes its ludicrous supernatural pirates plot seriously, and the result is a confident, enthralling spectacle. We haven't seen this kind of old-fashioned, crowd-pleasing, goofy, escapist popcorn entertainment since the glory days of early Spielberg and Lucas. By now, everyone knows the story of 'The Curse of the Black Pearl,' so no plot synopsis is needed. Besides, the often convoluted, admittedly overlong narrative is really just a skeleton to hang an increasingly breathless series of action sequences upon anyway. Yet what is so noteworthy about the first 'Pirates' is that the humanity of its characters is never sacrificed for the sake of bombast. Depp, again, is the film's sparkplug. It was widely reported that his then-controversial approach to Sparrow -- think a fey Keith Richards, mixed in with a bit of Pepe Le Pew -- caused major jitters with the higher-ups at Disney. Yet it is Depp's willingness to figuratively (and literally) walk the plank that keeps the rest of the film on its toes. Bloom and Knightley, as hopeful lovers Will Turner and Elizabeth Swann, gamely try to keep up, driven by a competitive energy that generates a palpable, invigorating chemistry. Geoffrey Rush also goes for broke as the cursed Barbossa, the undead pirate who makes a delicious, scene-chewing baddie that's easily on par with Depp's Sparrow. 'The Curse of the Black Pearl' is also a fantastic visual achievement. Director Gore Verbinski ('The Ring,' 'Mouse Hunt') finally found a blockbuster large enough to contain his usual stylistic excesses. The film's production design, costumes, cinematography and special effects are overblown in a wonderful way, and are just about flawless. The movie takes the key showpieces of the theme park ride and expands them handsomely into vast widescreen proportion, creating a whole new universe in the process. The film look and tone really does live up to the stirrings of our childhood imagination, just like when we first experienced the ride, yet it also finds a perfect balance between that whimsy and a darker, more adult sensibility. This is the rare instance when a huge budget was necessary, and pays off handsomely -- with every dollar right up there on the screen. Is 'Pirates of the Caribbean' a deep film? Surely not. But who cares, when it is so much fun? I still wish it wasn't quite so long, and for me, Depp soon wore out his welcome in 'Dead Man's Chest.' But revisiting 'The Curse of the Black Pearl' is to be reminded of how a crazy concept can actually work, if you've got a filmmaking team courageous enough to stick their necks out and just go for broke. If you're worried that a return trip to the land of the pirates may be a letdown, don't be -- 'The Curse of the Black Pearl' is still one terrific ride. 'Pirates of the Caribbean: The Curse of the Black Pearl' is one of the most eagerly-awaited catalog releases to hit Blu-ray yet, and picture quality-wise is easily on par with such hotly-anticipated rivals as HD DVD's new 'Ultimate Matrix Collection.' The stakes were high for Disney, but to their credit, they've completely hit it out of the park. This is truly a stunning visual presentation, so if you're looking for fresh demo material, look no further. The superlatives of this 2.40:1 widescreen 1080p/AVC MPEG-4 transfer are many. Disney has opted, of course, for a BD-50 dual-layer disc, so there are plenty of bits to go around. The result is an image of wonderful depth and realism. 'Curse of the Black Pearl' is almost equal parts bright daylight scenes and deep, dark interiors, and I was really amazed how adroitly both are rendered. The supple contrast and rich, inky blacks give the image fantastic pop. Shadow delineation matches any reference benchmark yet set, with even the darkest blacks still revealing small, subtle details and fine textures. Colors are exemplary, as well. 'Curse of the Black Pearl' is often awash in wonderful orange hues and striking midnight blues, and the entire color palette is boldly rendered. Fleshtones are natural and accurate, and colors clean and free from any noise. The source is also in tip-top shape -- I was surprised to find that this transfer is not grainy, especially given all the nighttime sequences. There are also no worries with compression artifacts, even on solid, static patches of color -- the presentation is always as firm as an anchor. This is a five-star transfer, no contest. The audio package on 'Curse of the Black Pearl' is also a stunner. Disney offers up an English PCM 5.1 surround track (48kHz/24-bit/6.9mpbs) and this one makes a great case for across-the-board studio support of uncompressed sound formats. Loud and pummeling, but a totally fun ride, 'Curse of the Black Pearl' made my home theater rig very, very happy. The most immediately noticeable characteristic of the film's sound design is simply how intense it is. Right from the opening scene -- with the flashback on the ship in a middle of a storm -- the surrounds are fully and forcefully engaged. I've heard plenty of great soundtracks with all manner of discrete effects, but the sustained wall of sound produced by 'Curse of the Black Pearl' is absolutely up there with the most engaging and wholly immersive home theater presentations I've had the pleasure to enjoy. Imaging between channels, the sense of palpable realism to the dynamics and the excellent balance of music and effects -- this one delivers a 360-degree soundfield that really is just about as close to perfection as you're likely to get outside of a state-of-the-art cinema. 'Curse of the Black Pearl,' however, is not just content to knock us out with its big action sequences. I place just as much emphasis on atmosphere as bombast. Some of my favorite sequences in 'Black Pearl' are quieter ones. I loved all of the pseudo-horror movie moments on Barbossa's supernatural ship, from the individualization of specific instruments in the score (which deliver a great, eerie ambiance) to the fine attention to subtle detail, such as the creaks and moans of the floorboards, which are directed with pinpoint accuracy to individual rear channels. Excellent. Dynamics are predictably outstanding. Low bass extends so deep that even with just a decent subwoofer you should be able to feel some serious impact. The sense of clarity and realism to the upper ranges also is palpable. And dialogue holds up smashingly. I remember finding Johnny Depp's frequent mumblings as Jack Sparrow almost incomprehensible at the theatrical screening I saw, but I had no such problems here. Even deep, low dialogue is intelligible, and volume balance is never an issue. In short, 'Curse of the Black Pearl' is my new favorite demo soundtrack on Blu-ray. 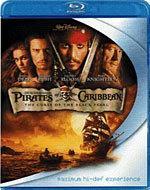 Disney has released 'Pirates of the Caribbean: The Curse of the Black Pearl' twice on standard-def DVD -- the first a two-disc set that was quite loaded, and then again in a three-disc version with a set of new extras that served mainly as an advert for the sequel, 'Dead Man's Chest.' Thankfully, there are no disappointments with this Blu-ray version. Disney has not jettisoned the set or tried to cram it down to a single disc -- instead, we get a full two discs worth of extras to wade through, and there is a ton of fun here! The only other remaining extra on disc one is a collection of trailers for other Disney Blu-ray titles. And in a very cool bonus, there is also a trailer for 'Pirates of the Caribbean: At World's End,' presented in full 1080p video. The rest of the video-based material is all presented on Disc 2. The first documentary is the 38-minute "An Epic at Sea: The Making of Pirates of the Caribbean," which is broken down into nine subsections (there is also a "Play All" function). This is a pretty typical if above-average EPK-like doc. All of the main cast and crew are present for on-set interviews (Verbinski, Bruckheimer, Depp, Knightly, etc. ), but what's interesting in hindsight is the genuine sense of risk (almost panic) that seemed to permeate the set -- no one seemed to have any idea whether or not this crazy idea for a movie-based-on-a-theme-park ride was gonna fly. And all the tech talk is more fascinating here than usual -- especially the section on the film's many pirate ships, as well as another on the CGI used to turn Geoffrey Rush and Barbossa's motley crew of undead into believable supernatural characters. Next is "Fly on the Set," a collection of five video assemblages that go into greater detail about specific sequences from the film: "The Town Attack," "Tortuga," "The Blacksmith Shop," "The Cave" and "Jack's Hanging." The footage runs about 20 minutes total, and unlike the doc, is narration-free. This stuff is fairly fun to watch, but does get a bit old after a while. Better are the three Video Diaries. I always like this approach, because we get a first-person perspective from cast and crew, without all the hyperbole usually associated with a fawning EPK (aka, extended commercial). Contributing another nearly 20 minutes of material are: producer Jerry Bruckheimer's "Photo Diary" (4 min.) which is still-based, the "Diary of a Pirate" (9 min. ), featuring actor Lee Arenberg, who plays "Pintel," and "Diary of a Ship" (8 min.) by the crew of the real Lady Washington, which stood in for the H.M.S. Interceptor in the film. Following that is a collection of nineteen Deleted Scenes. All look to be mere extensions of existing material -- additional lines here or there, but no major new scenes or effects sequences. There's nothing here that really expands all that much on the characters or the plot, so I found it rather unmemorable. Also, since the total footage only runs 19 minutes, that amounts to only about a minute a scene -- pretty slim. As things wrap up, there are a few other odds and ends of interest. The "Moonlight Serenade Progression" is a nearly 7-minute deconstruction of the moment when the spectral pirates are first revealed. The scene is shown from its pre-production computer rending, through the various digital "plates," to the final scene. There is also a 3-minute Blooper Reel, which is pretty amusing, including lots of flubbed lines and stunts-gone-wrong. Even the usually stoic Depp seems playful here. I also loved the vintage excerpt from the old "Walt Disney's Wonderful World of Color" TV show, dating back to January, 1968, which takes us on a 17-minute tour of the original "Pirates of the Caribbean" attraction at Disneyland. I really appreciate this kind of historical material, as it is dripping with nostalgia and adds great context to the movie. Finally, there is an Image Gallery with about 200 images. It is largely devoted to concept art, storyboards and costumes, with some more generic on-set production stills and publicity shots of the cast in character. 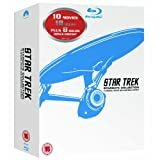 All in all, this is a very nice collection of material, and fans hoping to upgrade their existing 'Curse of the Black Pearl' standard-def DVDs can do so with confidence. However, once again, this release is another example of a studio simply porting over all of the same extras as before, without including any video in high-def resolution. All of the video-based material above -- and indeed, the whole second bonus disc -- is 480i/MPEG-2 video only. It's the only complaint I have about this otherwise fantastic set of extras. 'Pirates of the Caribbean: The Curse of the Black Pearl' holds up as a grand entertainment (especially in comparison to the over-inflated sequel), and this Blu-ray version is simply outstanding. Both the video and audio are five-star, reference-quality presentations, while the supplements match everything that was offered on the standard-def versions. Plus, there is even a Blu-ray exclusive trivia feature as a bonus. Disney has delivered a booty of Blu-ray treasure with 'The Curse of the Black Pearl,' so definitely pick up this disc without hesitation.